There are so many different variations of meatballs around the world as there are reggae music genres. They are all different in the inside but when we look at them, we have no doubt about what we are looking at. Meatballs are among us since medieval times in one form or the other. No wonder that since then every nation developed its national variety of this dish and some has even more than one. 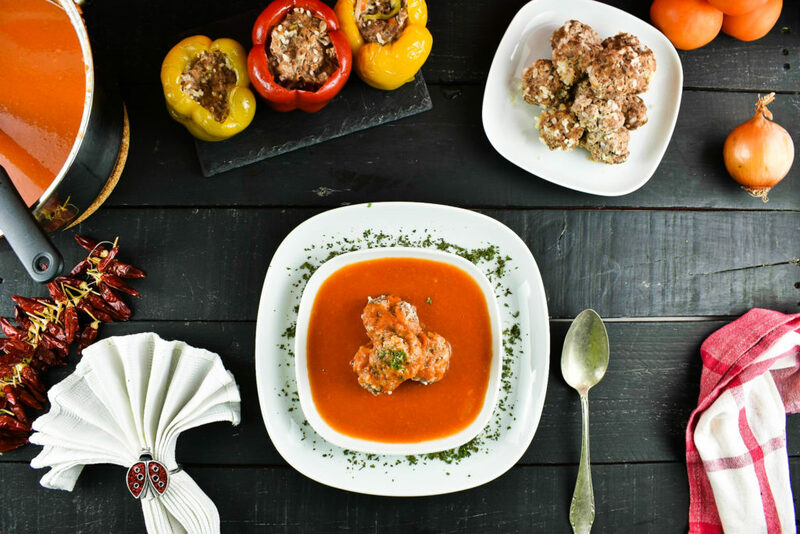 Meatballs can be prepared by almost any means imaginable that is used for heat involved food preparation. Some like them steam cooked, others swear on deep frying while another simply boil them. However, meatballs can be made entirely out of meat and spices, it is rather rarely done that way. Generally, it is mixed with something that gives it some volume and lighten up the otherwise too meat dense texture. Probably the most popular choice is to mix some kind of bread, like breadcrumbs or sometimes soaked stale bread with the meat, herbs and egg mixture. Albeit we could produce a dish that contains the carbs and protein in one bite and should not need anything else, except maybe some side salad to be a whole dish, yet this is not the most frequent scenario. Side dishes for meatballs, even if aren’t made entirely out of meat, include the well-known high carbs food like fried and mashed potato, rice, pasta and even pizza. We can’t argue with that though. Pizza with meat balls must be as epic as Bob Marley’s One love. This recipe skips the breadcrumbs and uses rice as a volume enhancer which is a naturally gluten free ingredient and easy to work with. Its bland taste can be easily altered during its preparation, thus making it available in sour and sweet dishes alike. 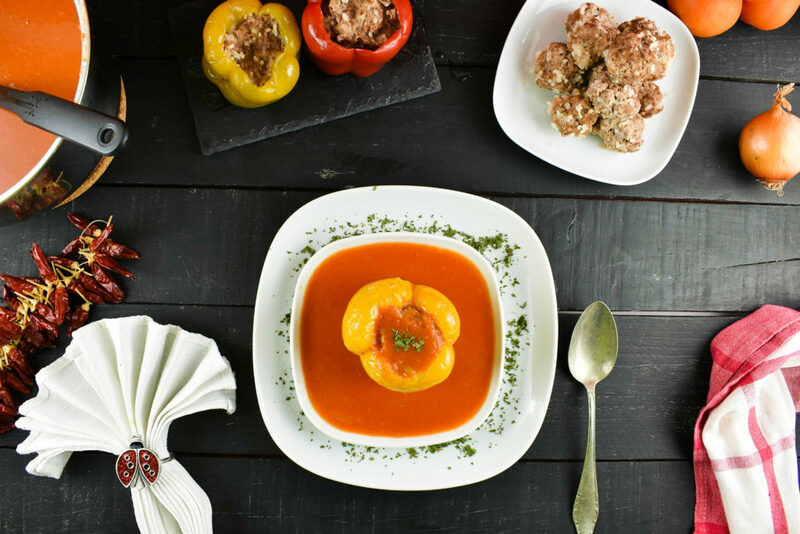 As carbs are already mixed with the meat, there is no need for additional side dish like the generally used pasta, fries or anything at all bar the tomato sauce comes with it. 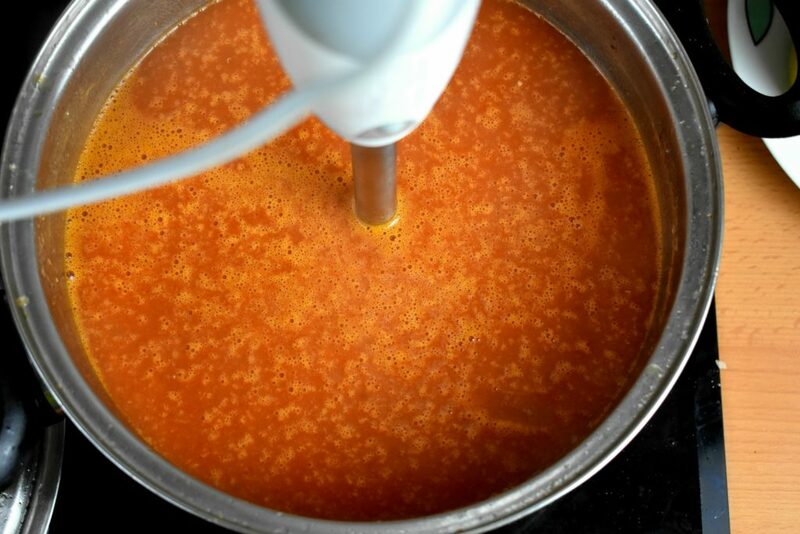 The tomato sauce can be thickened with roux or some kind of starch but if we are after a low carb solution, it isn’t recommended nor necessary. In case the sauce seems to be too thin to our taste, there are two starch free options to consider. Reduce the sauce’s volume by simmering it away. 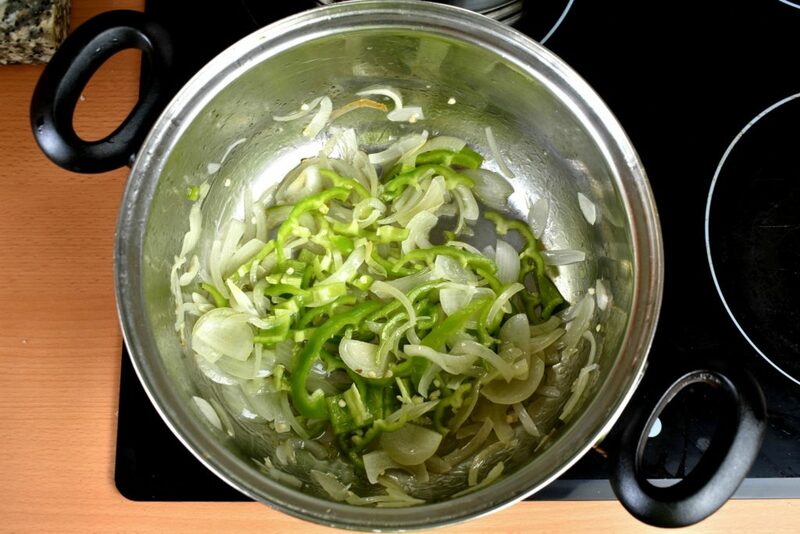 This is one of the best solutions as it will not only make the soup thicker but it concentrates the flavors too. 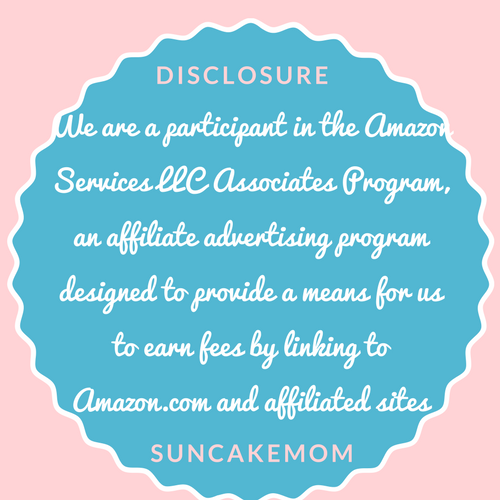 The backside of this method is that it takes some time. Another solution or rather complementary solution to the simmering is, adding mirepoix to the sauce which will thicken it somewhat more. Mirepoix is the French name of a sautéed diced vegetable base used in cooking. It consists of one onion, one carrot and two celery stalks, diced and sautéed in a frying pan on oil until the onion starts to turn brown. We can keep sautéing the mirepoix longer, for about 20 minutes on low heat until the onion caramelizes. This will give our sauce a touch of sweet that tomatoes, especially canned sugar free tomatoes, can use to their advantage. Pour the oil into a big pot that could accommodate the balls. 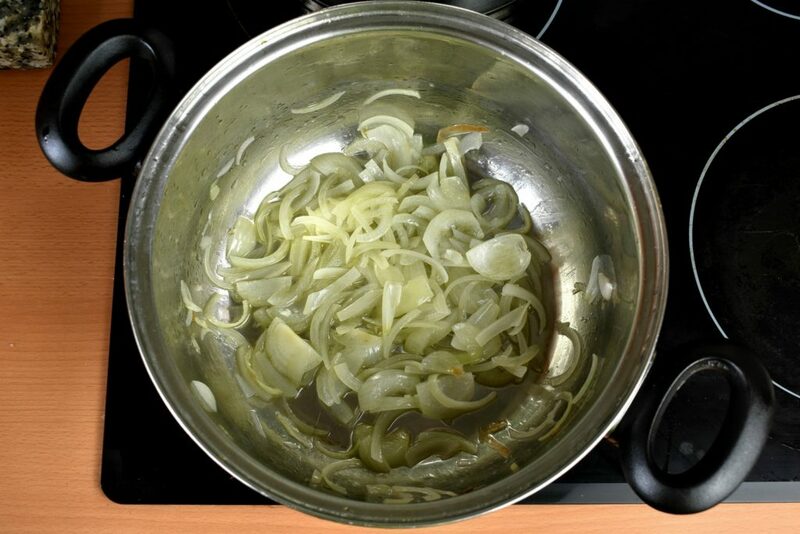 Add onion with the salt and saute it until it gets a translucent / glassy look, for 2-3 minutes. Add pepper and saute them for another 2-3 minutes. Add the tomato and paprika then bring the dish to boil. 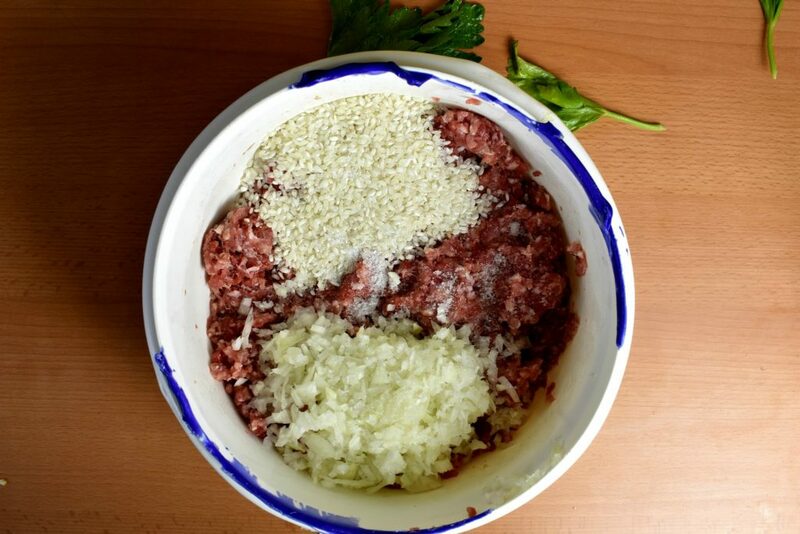 Mix Rice, salt, onion and meat. 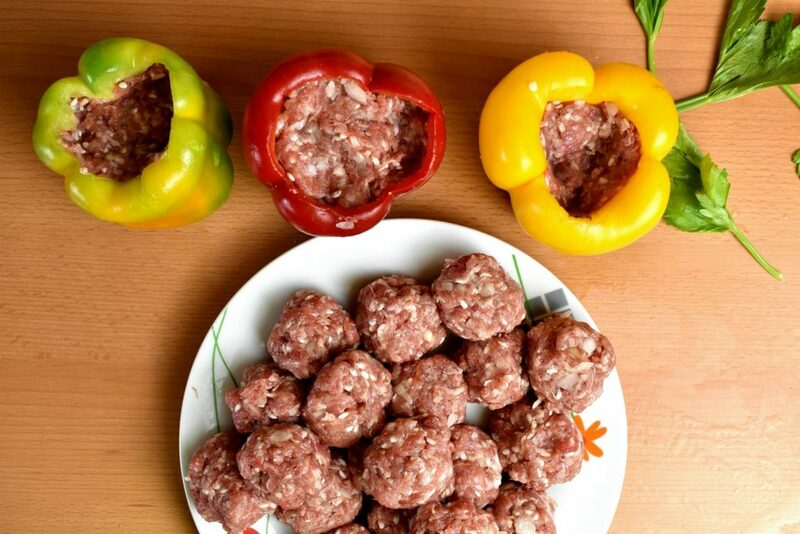 Form balls of desired size or fill some peppers with the meat. 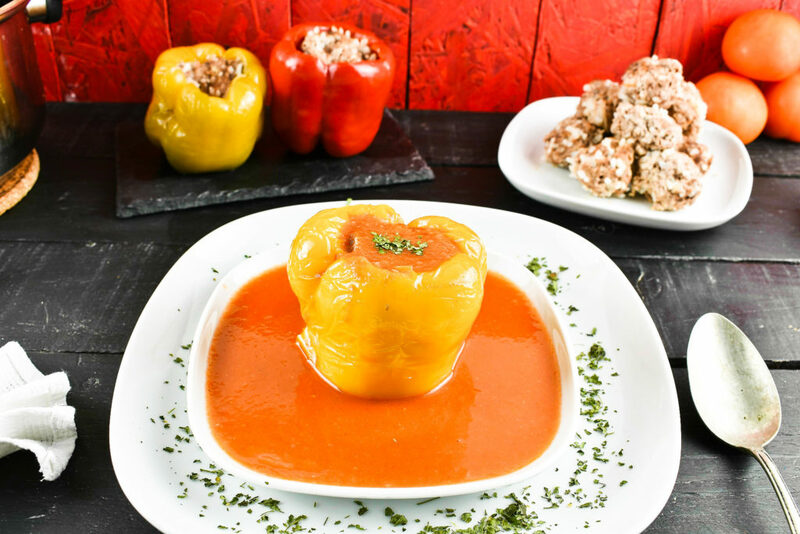 Immerse the balls or the stuffed pepper into the simmering tomato sauce. 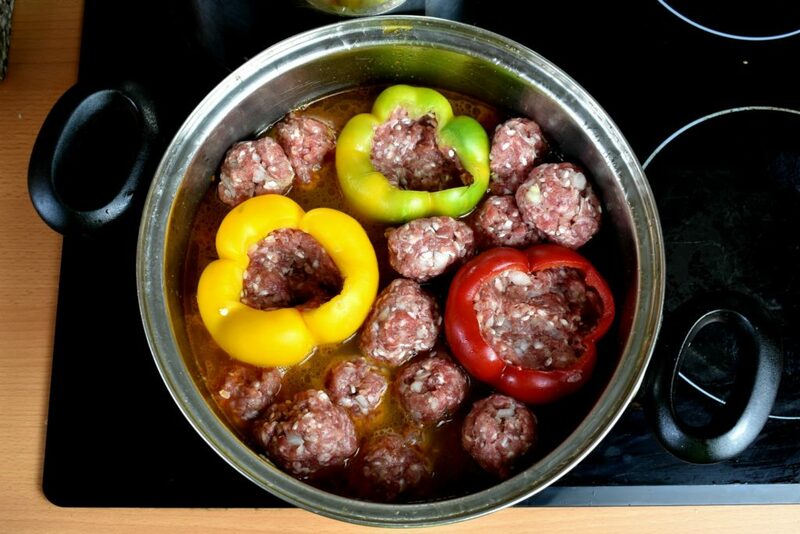 In case the meatballs aren’t covered fully, add more tomato sauce or fill it up with water. Add water sparingly as it will dilute the sauce and it needs to be cooked away at the end or thickened with some kind of starch. Put the lid on then bring it to boil and keep simmering on low heat until the rice is cooked, for about 20 minutes. When the rice is done, the meat is done too and the balls are ready to be taken out. 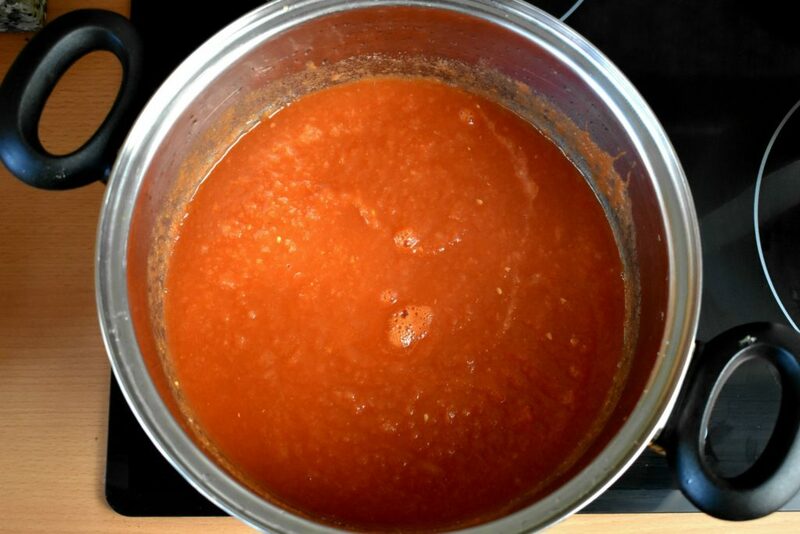 Blend the remaining tomato sauce with the onion and the pepper. Simmer the tomato sauce further until it gets a desired thickness. Mind that it is a tad bit thinner when hot and it will thicken a bit when cooled to serving temperature. 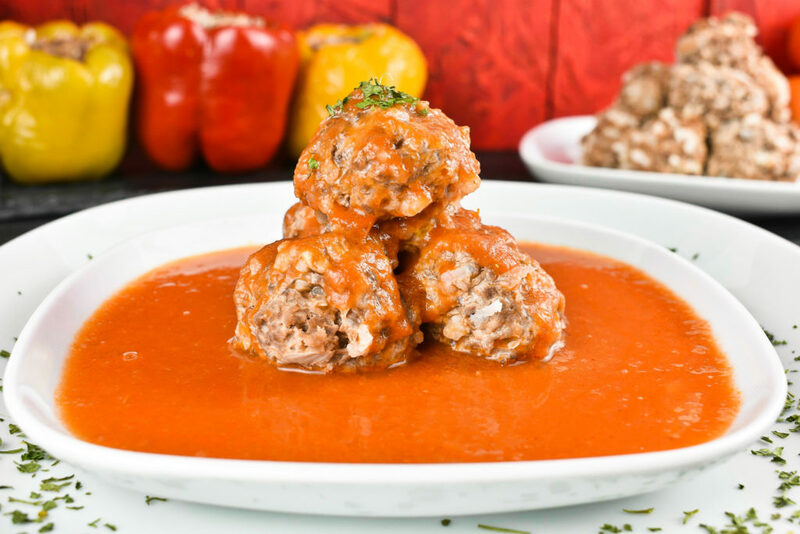 Life is without meatballs is like a sailing boat without sails. 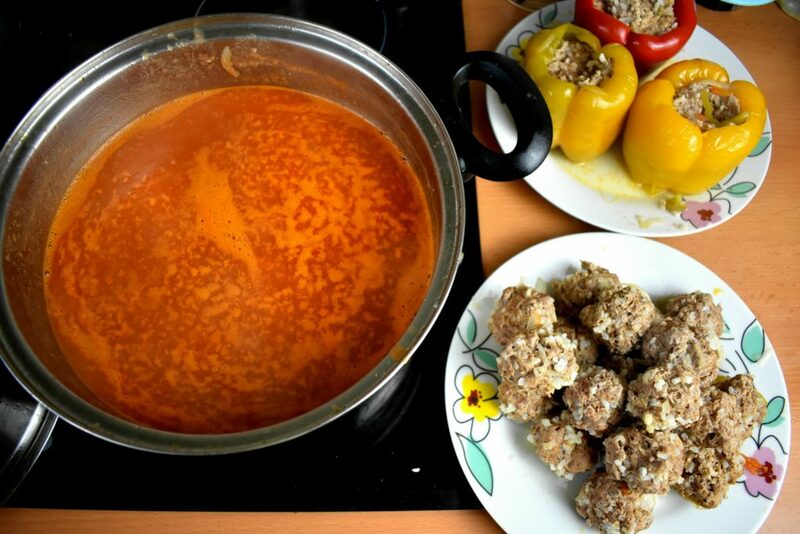 Let these naturally gluten free rice filled meat balls embolden us through the voyage. 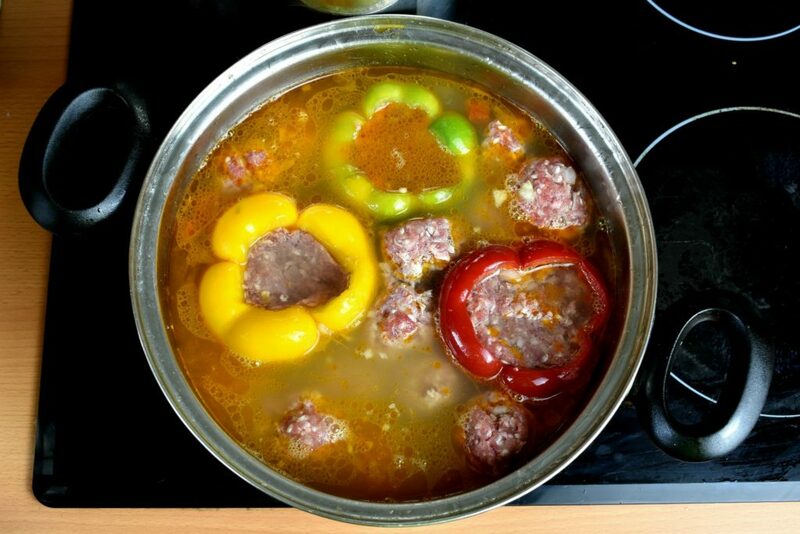 Immerse the balls or the stuffed pepper into the simmering tomato sauce. In case the meatballs aren't covered fully, add more tomato sauce or fill it up with water. Add water sparingly as it will dilute the sauce and it needs to be cooked away at the end or thickened with some kind of starch.